The curry tree (Murraya koenigii) also known as sweet neem or kadi patta or curry vepila, is a tropical to sub-tropical tree in the family Rutaceae (the rue family, which includes rue, citrus, and satinwood), which is native to India. Its leaves are used in many dishes in Indian subcontinent. 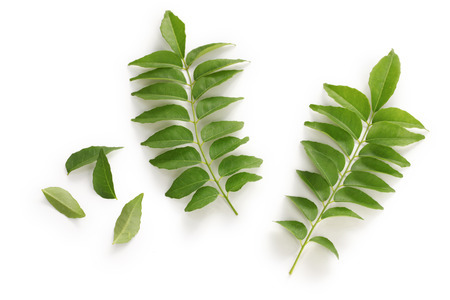 Often used in curries, the leaves are generally called by the name "curry leaves", although they are also literally "sweet neem leaves" in most Indian languages (as opposed to ordinary neem leaves which are very bitter and in the family Meliaceae, not Rutaceae). It is a small tree, growing 4–6 m (13–20 feet) tall, with a trunk up to 40 cm (16 in) diameter. The aromatic leaves are pinnate, with 11–21 leaflets, each leaflet 2–4 cm (0.79–1.57 in) long and 1–2 cm (0.39–0.79 in) broad. The plant produces small white flowers which can self-pollinate to produce small shiny-black drupes containing a single, large viable seed. Though the berry pulp is edible—with a sweet but medicinal flavour—in general, neither the pulp nor seed is used for culinary purposes. The tree is native to the Indian subcontinent, and can be found growing wild throughout the country, in Sri Lanka, and east through Thailand. Commercial plantations have been established in India, and more recently Australia. It grows best in well-drained soils in areas with full sun or partial shade, preferably away from the wind. Growth is more robust when temperatures are at least 65°F. The fresh leaves are valued as seasoning in the cuisines of Southeast Asia. They are most widely used in southern and west-coast Indian cooking, usually fried along with vegetable oil, mustard seeds and chopped onions in the first stage of the preparation. They are also used to make thoran, vada, rasam and kadhi. In Cambodia, the leaves are roasted and used as an ingredient in a soup, maju kreung. In Java, the leaves are often stewed to flavor gulai. Though available dried, the aroma and flavor is greatly inferior. The oil can be extracted and used to make scented soaps. The leaves of Murraya koenigii are also used as a herb in Ayurvedic and Siddha medicine in which they are believed to possess anti-disease properties, but there is no high-quality clinical evidence for such effects. Seeds must be ripe and fresh to plant; dried or shriveled fruits are not viable. One can plant the whole fruit, but it is best to remove the pulp before planting in potting mix that is kept moist but not wet. Stem cuttings can be also used for propagation. Compounds found in curry tree leaves, stems, bark, and seeds contain cinnamaldehyde, and numerous carbazole alkaloids, including mahanimbine, girinimbine, and mahanine.